Prominent member of the Sanhedrin, and a man of wealth; lived in Jerusalem in the first century C.E. He is mentioned in John iii. 1-21, vii. 50, xix. 39. In the first of these passages he is represented as "a ruler of the Jews" who learned from Jesus what "rebirth by baptism" meant, as if that rabbinical term had been altogether unknown to him (but see Baptism and Birth, New). The second passage records how he made his visit to Jesus by night, in order that he might not be known as one of the latter's disciples. In the third passage he and Joseph of Arimathæa are described as having taken charge of the body of Jesus in order to give it decent burial. That the man brought into such prominence in the fourth Gospel must havebeen a well-known figure of Jewish society at the time is evident. 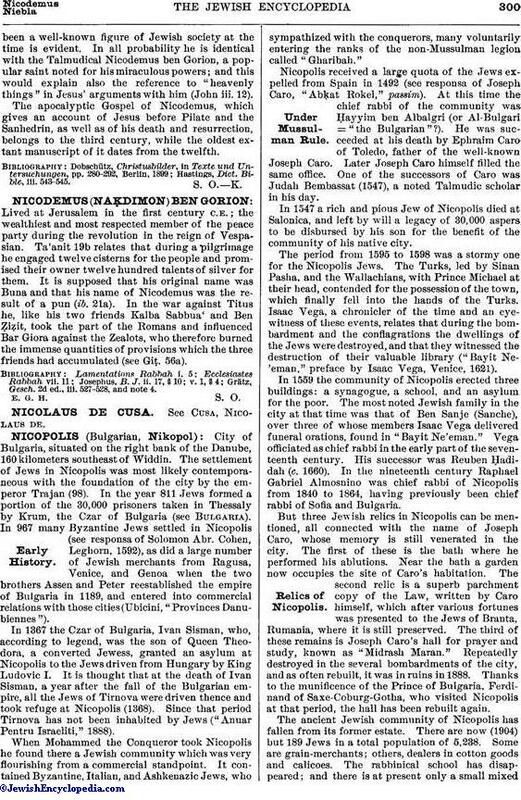 In all probability he is identical with the Talmudical Nicodemus ben Gorion, a popular saint noted for his miraculous powers; and this would explain also the reference to "heavenly things" in Jesus' arguments with him (John iii. 12). 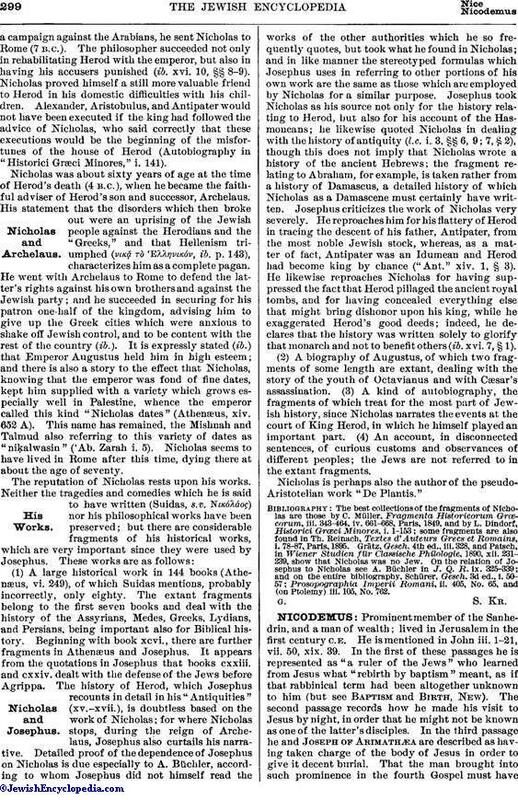 The apocalyptic Gospel of Nicodemus, which gives an account of Jesus before Pilate and the Sanhedrin, as well as of his death and resurrection, belongs to the third century, while the oldest extant manuscript of it dates from the twelfth. Hastings, Dict. Bible, iii. 543-545.